We love Swordfish! The texture of its meat. The versatility of seasonings and the countless compatible additions. When cooked in a smoking pan for a short time, it’s never dry and it’s always juicy. 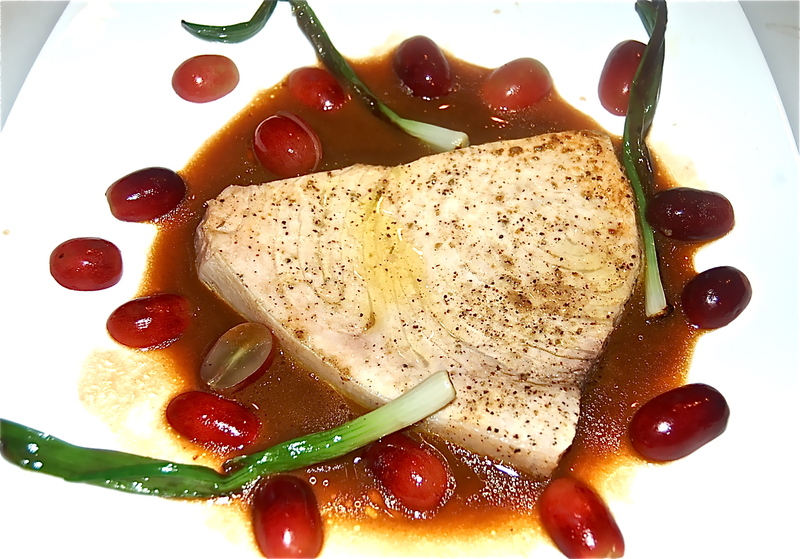 In our opinion overcooking a Swordfish steak is intentionally destroying it. When recipes call for 15 minutes of cooking in a covered pan, and they sometimes do, I simply can’t understand the reasoning. This is because the longer it’s cooked, the drier it will naturally become. 1. Heat 1/2 TB of EVOO in a skillet, & saute the Scallions until they have softened. Set aside on a plate. Stem and halve the Grapes. Set them aside in two equal bowls. 2. In a small saucepan, add either the Clam or Chicken Broth & the Seafood & Fish Stock. Bring the sauce pan to a boil & simmer for a few minutes. Turn off the heat & actively whisk in the 2 TB of Butter in small pieces to emulsify the sauce. Set aside. 3 Generously season the Swordfish Steaks. Heat a large saute pan, add a 1/2 TB of EVOO & 1/2 tsp of Butter. Saute for no more that 1-1/2 minutes to a side. They will be cooked through. 4. To plate, Spoon the Seafood & Fish Sauce onto each plate. Top with a Swordfish Steak & a dollup more of sauce. Surround with the Scallions & the Grapes.